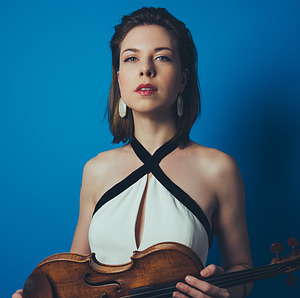 Violinist Tessa Lark, recipient of a 2018 Borletti-Buitoni Trust Fellowship and a 2016 Avery Fisher Career Grant, Silver Medalist in the 9th Quadrennial International Violin Competition of Indianapolis, and winner of the 2012 Naumburg International Violin Competition, is one of the most captivating artistic voices of our time. She has consistently been praised by critics and audiences for her astounding range of sounds, technical agility, and musical elegance. A budding superstar in the classical realm, she is also a highly acclaimed fiddler in the tradition of her native Kentucky, delighting audiences with programming that includes Appalachian and bluegrass music and inspiring composers to write for her. Ms. Lark has been a featured soloist at numerous U.S. orchestras since making her concerto debut with the Cincinnati Symphony Orchestra at age sixteen. She performed at Carnegie Hall’s Weill Recital Hall in 2017 on Carnegie's Distinctive Debuts series, and again the following year as part of APAP's Young Performers Career Advancement showcase. Ms. Lark has appeared at such venues as Amsterdam's Concertgebouw, the Isabella Stewart Gardner Museum in Boston, the Perlman Music Program, San Francisco Performances, Dame Myra Hess Memorial Concerts, Ravinia’s Bennett-Gordon Classics series, Troy Chromatic Concerts, Chamber Music Tulsa, Caramoor's Wednesday Morning Concerts, the Seattle Chamber Music Society, and the Marlboro, Yellow Barn, Olympic, and Music@Menlo festivals. Highlights of her 2017-18 and 2018-19 seasons include multiple performances of two works for violin and orchestra written for her: Love Letter by bassist-composer Michael Thurber, and SKY, a bluegrass-inspired concerto by Michael Torke that Ms. Lark premiered and recorded with the Albany (NY) Symphony Orchestra and will take to nine other U.S. orchestras that signed on as co-commissioners of the work. Her 2018-19 season includes debut appearances with the Seattle and Indianapolis symphony orchestras and a four-concert engagement with Australia’s Musica Viva festival highlighted by a duo collaboration with bassist/composer Edgar Meyer. Scheduled for May 2020 is her Lincoln Center recital debut on the Great Performers Series. Ms. Lark’s recording projects, in addition to the forthcoming Albany Symphony release, include a fantasy-themed album consisting of her own Appalachian Fantasy and works by Telemann, Ravel, Kreisler, and Schubert; Invention, a debut album of the violin-bass duo Tessa Lark & Michael Thurber that comprises music of J.S. Bach along with non-classical original compositions; and a genre-bending disc in collaboration with such artists as multi-instrumentalist/composer Jon Batiste and American fiddling legend Michael Cleveland. A passionate chamber musician, Ms. Lark has toured with musicians from Ravinia’s Steans Music Institute and Musicians from Marlboro. Her piano trio, Trio Modêtre (now known as the Namirovsky-Lark-Pae Trio), was awarded one of the top prizes in the 2012 Fischoff National Chamber Music Competition. Ms. Lark has collaborated with such renowned artists as Mitsuko Uchida, Itzhak Perlman, Miriam Fried, Donald Weilerstein, Pamela Frank, Kim Kashkashian, Peter Wiley, and Ralph Kirshbaum. She joined Caramoor Virtuosi as a result of her participation in Caramoor's Rising Stars Series. Keeping in touch with her Kentucky roots, Ms. Lark performs and programs bluegrass and Appalachian music regularly and collaborated with Mark O'Connor on his album MOC4, released in June 2014. She also plays jazz violin, most recently performing with the Juilliard Jazz Ensemble at Dizzy’s Club Coca Cola in New York City. She premiered her own Appalachian Fantasy as part of her Distinctive Debuts recital at Carnegie Hall, where she also gave the world premiere of Michael Torke’s Spoon Bread, written specifically for her stylistic capabilities. In addition to her busy performance schedule, Ms. Lark has served on the faculty of the Great Wall International Music Academy in Beijing, and as an alumna of NPR’s From the Top she is active in that radio show’s arts leadership program as a performer and educator. Ms. Lark’s primary mentors include Cathy McGlasson, Kurt Sassmannshaus, Miriam Fried, and Lucy Chapman. She is a graduate of New England Conservatory and completed her Artist Diploma at The Juilliard School, where she studied with Sylvia Rosenberg, Ida Kavafian, and Daniel Phillips. Ms. Lark plays a ca.1600 G.P. Maggini violin on loan from an anonymous donor through the Stradivari Society of Chicago. Tessa Lark is represented worldwide by Manhattan-based Sciolino Artist Management, www.samnyc.us. Do not make any alterations to this biography. Concert presenters and other interested parties may obtain an updated and/or abridged version by contacting Chester Lane, Director of Communications at Sciolino Artist Management, chester@samnyc.us.